Okay, so here’s the deal. I used to think Father’s Day was one of those ridiculous holidays that the greeting card companies hyped up to help out their cash flow…you know, like they did with Valentine’s Day, St. Patrick’s Day, etc., etc. (sidebar: for those of you who actually celebrate the aforementioned holidays for the RIGHT reasons instead of an excuse to buy expensive stuff or drink green beer, I applaud you and you should not be offended that I poked a little fun at the ridiculousness of how MOST people celebrate these events). Anyway, for the past couple of years, Stacy has looked at Father’s Day through the lens of being frugal and also by asking dads to share some funny stories. This time around, I dug deep into my thoughts and asked myself: “self, what would you like as an awesome Father’s Day gift – one you’d actually use?” Self responded: “a Porsche 911 GT2, no speed limit and a full fuel tank.” Then I told self he was being a little ridiculous. So when self came to his senses, we agreed something a bit more reasonable might be in order. Here’s what we came up with. Am I right? You know I am. I’d like to smell nice, feel good and pamper myself just a little without feeling ridiculous. That’s why this smelliness among men is epidemic. We can’t help but choose option 1 when options 2 and 3 are just so…wrong. 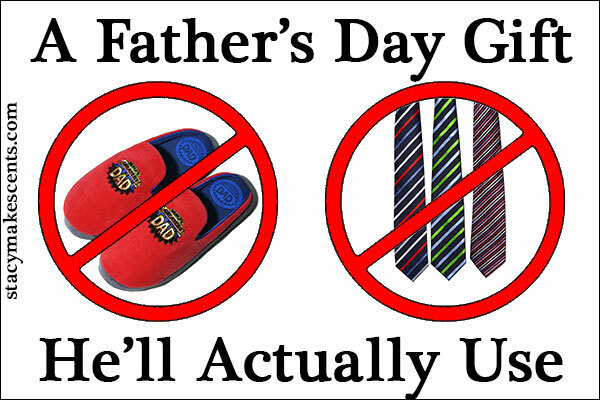 The ideal Father’s Day gift would solve this conundrum and your man (although he’d never admit it) would thank you. Here’s my proposal – let’s start with something that doesn’t invade his fear of smelling good too deeply – let’s start with the shave. We’ll work up to the rest of it. About 8 years ago, I decided to do something about my sensitive skin issues that for years had made it a pain to shave. Everything I read said to switch from using shave creams and gels to a good shave soap and a brush. Around that time, I happened across Thistle Ridge Soap’s booth at the Virginia Highlands Craft Festival in Abingdon, VA and a little hesitantly, I bought a bar of their shave soap and got a shave mug and brush. I’ve never looked back. It is awesome! To take it a step further, I also decided to switch to a good old-fashioned safety razor after reading it would help too. I’ve completely stopped using throwaway razors and embraced the old school way. A single bar of Thistle Ridge shave soap lasts me about 6 months (yes, really!). I’m on my second shave brush in about 8 years. So without spending a fortune and without making him smell like a girl, you can get him a Father’s Day gift he’ll actually use. If your man has sensitive skin like me, get him a good shave brush, a bar or two of Thistle Ridge shave soap and a mug to put it in. If you’re brave, you might even get him a high quality safety razor, although it admittedly does take a bit of getting used to. Once you’ve gotten him comfortable with the new world of old school shaving (is that an oxymoron? ), might I suggest you replace the bar of soap in his shower? Nowadays, just about every bar of soap I can find smells like flowers or some other girly junk. For the love of Pete, what’s the deal!? Some companies have caught on and make body wash for men, but then what – should we use a loofa? That’s crazy talk. I want SOAP. Now let’s compare that to the awesome soap Thistle Ridge gave me to try. 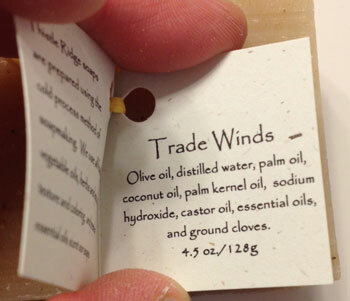 I’ll admit the Dove® stuff smells pretty good, but so does the soap from Thistle Ridge. Any guess which I’m gonna suggest you buy for your man? If you aren’t sure, go back and look at those ingredients again. And while you’re shopping for some soap for him, why not buy a few bars for yourself of the lavender soap or grab a few bars of the oatmeal soap that will work well for anyone in the family (including the kiddos)? I’ll admit I’m pushing you to buy something – isn’t that the point of a post about “gifts for Father’s Day”? Why am I pushing you to buy it? Because as I see it, you can either get him this and watch him enjoy it for a long time to come or you can buy him any other gift and he’ll still smell like…well…like a guy. How long was the code good for, I tried it today and it doesn’t seem to be working. That code did expire. Sorry. 🙁 I’ve removed it. Hi Megan. The code expired on the 31st of May. So sorry! Let me say, he absolutely loves using the brush & safety razor. Thank you so much for inspiring us and saving us a bunch of money 🙂 Now I have to get brave enough to make the switch myself…. How did you decide on a razor? I’ve been looking for one for my husband for a while…just unsure where to start, and it’s not financially feasible to buy a lot of different ones until we find a decent one. This would be great for him though…we’re both tired of the razor burn! We really didn’t know which would work best and so we read reviews and settled on one that wasn’t too expensive but got good review: http://www.amazon.com/gp/product/B003YJ70NY/ref=as_li_ss_tl?ie=UTF8&camp=1789&creative=390957&creativeASIN=B003YJ70NY&linkCode=as2&tag=stamakcen-20. It has been a very good one and is easy to use. Is it just me? I don’t see a rafflecopter link! Carol – try using a different internet browser. Sometimes it’s finicky. Thanks for the wonderful idea! I remember my dad using that razor when I was a kid! Never knew they still existed and my husband has sensitive skin so this would be great for him! Great! Glad you got a good idea for him. Alright, I need some more info! LOL! My husband uses Gillette Fusion Proglide Power and won’t let me buy anything else because he says they tear up his face the least. It is so frustrating because those stupid things cost a FORTUNE!!! He only uses them 2-3 shaves before throwing them away. It just makes me cringe because it’s so expensive. So I beg him to use them a few more times, and sometimes he will, but then he’ll just bleed all over the place, LOL! I have never heard of a safety razor. How do they work? So you buy the stick and replace the blades? Or do you sharpen the blades? I have been thinking about a straight razor because it would be wayyyy cheaper. But maybe safety razor with some shave soap is the way to go, I guess! I have no idea where to start or where to get this stuff in Canada! Here’s a little more info from Stacy’s perspective – http://www.stacymakescents.com/ditching-disposable-razors. Safety razor blades are much cheaper and have been around FOREVER. I order mine from Amazon (http://www.amazon.com/gp/product/B000JPMHWK/ref=as_li_ss_tl?ie=UTF8&camp=1789&creative=390957&creativeASIN=B000JPMHWK&linkCode=as2&tag=stamakcen-20). The razor itself is a bit more expensive but only a 1-time purchase. I still have a travel Gillette razor that was from the 1950’s that I sometimes use. The one I bought for daily use is this one: http://www.amazon.com/gp/product/B003YJ70NY/ref=as_li_ss_tl?ie=UTF8&camp=1789&creative=390957&creativeASIN=B003YJ70NY&linkCode=as2&tag=stamakcen-20 although Parker makes some nice ones as well. I’m going to print this off for my low tech, no time for the computer husband. He once used baby shampoo because I disliked his men’s body wash so much. His face is super sensitive and I have been suggesting the soap and brush method for a few years. He also doesn’t like change ;-). Maybe a man’s opinion will help! Not to point out the obvious,but how is Father’s Day any more ridiculous than oh. Don’t know “mothers day” come on are really that sexist. And by the way did you ever consider both men and we on smell exactly alike the only difference being men don’t smother themselves is scented oils and a ridiculous amounts of perfumes. And I have met some pretty unpleasant smelling gals in my thirty six years,you know they don’t make duches for men for a reason ,so who is in fact the smellier of the two sexes?? Sounds like your husband has the misfortune of living in the same house with you,if sure your just a peach of pleasentries I’m sure you brow beat and nag to no end . Poor guy probably dosent get a moment of peace whe n your around. Hi George, this is Barry – Stacy’s husband and the AUTHOR OF THE POST! Not sure if you noticed that or not in your haste to be so disrespectful to my beautiful bride. For anyone reading this post and comment, let me make something absolutely clear. George (or anyone else) will not speak to anyone in my family in such a manner…PERIOD. George, I would encourage you to find another place to leave your hateful commentary. The entire reason we have a comment policy is due to those who would feel this an open space on which they can say whatever they wish. If you (George, or anyone) wishes to make a negative comment that actually carries the conversation forward, you are welcome to do so. But attacking my family in any form will not be accepted. So I’m wondering about the razor thing. Awhile ago Stacy posted about using a razor w/ the 20 cent replacement blades, but the conversation went in several directions and I am wondering if you settled on that or a different kind. We’ve been talking razors in our household too! Hey Adrienne, we did settle out on using a safety razor and replacement blades. Usually we get those off Amazon and they aren’t that expensive. We have a few of the other kinds left over but don’t use them much anymore. A good safety razor and sharp blade makes for a great shave and, when done right, no razor burn. We live near them and enjoy their products and their service! I couldn’t agree more. Great products, great people!